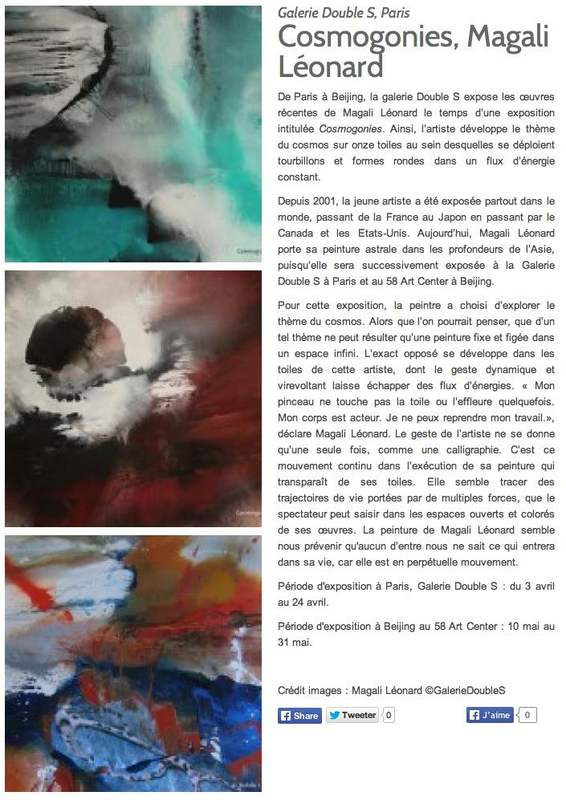 Cosmogonies, Magali Léonard From Paris to Beijing the DOUBLE S gallery is showing recent paintings of Magali Leonard in an exhibition named “Cosmogonies”. The artist develops the theme of the cosmos in 11 paintings in which swirls  and rounded forms are unfurling in a constant flow of energy. Since 2001, the young artist has exhibited all over the world, from France to Japan, Canada and United States. Today, Magali Leonard brings her astral paintings deep into Asia since she will exhibit successively at the Double S in Paris and at the 58 art center in Beijing. For this exhibition, the painter chose to explore the cosmos. One would think such a theme would suggest fixed and unmoving paintings in an infinite space. It’s exactly the opposite in the paintings of this artist, whose dynamic and spinning gestures create a flux of energy. “My brush doesn’t touch the canvas or touches it very lightly at times. My body is the actor. I can’t alter my work once it has been done’, says Magali Léonard. The gesture of the artist give itself only once, like a calligraphy. It’s this continuous movement that is ever-present in her paintings. She seems to trace trajectories of life influenced by multiple forces; that the spectator may catch in the open and coloured spaces of her paintings. Magali Leonard ‘s paintings seems inform us that nobody knows what will happen in their life because life itself is in continual movement.